Today marks World Ranger Day but amidst the celebration and appreciation for rangers worldwide, it’s also a day tinged with sadness as we’re reminded of the risks and dangers rangers face daily to help save our shared wildlife. Over the last year, we’ve seen some of the most brutal attacks on rangers in the line of duty including the murder of Rachel Katumwa, the first female ranger thought to be killed whilst on duty in Virunga National Park in the Democratic Republic of Congo. Just a month prior to Rachel’s murder in the same area, suspected members of an armed militia group that were involved in poaching activity gunned down five wildlife rangers and their driver. It was the worst attack in Virunga’s history and the latest in a long line of tragic incidents in which rangers have lost their lives defending the planet’s natural heritage. International Ranger Federation (IRF) & Thin Green Line Foundation (TGLF), confirmed the official death toll from July 2017-18 as 107 people, up from 101 last year. This brings the total number of reported rangers who have lost their lives in the line of duty to 871* in just nine years. And, this figure only accounts for officially recorded deaths. It’s believed the actual number of deaths is much higher. WWF works with rangers across the world, who are on the front line of protecting much of our iconic wildlife, and we’re calling for greater action from governments to tackle the increasing death toll, poor medical treatment and lack of insurance for wildlife rangers. 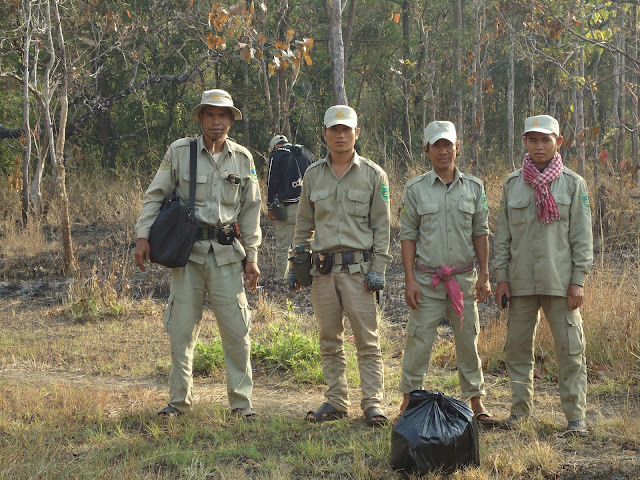 Our latest survey carried out across Asia and Central Africa, has shown that one in seven wildlife rangers have been seriously injured at work within the last 12 months. Every day they risk all, facing armed poachers, dangerous encounters with wildlife and exposure to infectious dieses like malaria. Yet, only 15 per cent of the rangers we asked had been trained in first aid within the last year and almost six out of ten felt that when most in need of medical treatment, the help they received was not adequate. In Asia, on average a ranger gets paid USD 292 per month, and in Central Africa USD 150 per month– most often this is the main (or only) source of income for their families. The survey also highlights the concerning lack of insurance for rangers and their dependents. Despite life-changing injuries and death so commonplace within the profession, just 36 per cent indicated that they had insurance coverage for such situations. Should rangers become injured and are no longer able to work - or worse yet are killed - in the line of duty, the entire family are left vulnerable to a life of poverty. WWF is also currently conducting the survey in East Africa, a region renowned to be the most dangerous for the profession due to high levels of poaching to feed the demand for illegal wildlife trade products, largely coming from China and neighbouring countries. We are calling upon governments to urgently review and address the shortcomings that are endangering the lives of wildlife rangers. Adequate training, strong emergency medical treatment plans, as well as equipment and communications devices appropriate for field conditions are key among the many matters that need an urgent review. We hope to see commitments from world leaders in countries where wildlife poaching occurs, at the upcoming London Conference on Illegal Wildlife Trade, taking place in October this year. You can help too, write to your local governments, support organisations helping to improve the lives of rangers and keep the discussions alive. Read on to find out what the colleagues and family of Manzoor Ahmad, a wildlife inspector in Pakistan, who was shot dead by poachers on 20 September 2017 had to say about his life and his work. Manzoor is survived by an elderly mother, a wife and seven children. Manzoor was stationed at the Punjab Wildlife and Park Department in Punjab, Pakistan as Wildlife Inspector in the special squad, dedicated to monitor and intercept poaching and illegal hunting. He joined the department in 1984. His last annual salary was 4,320 USD after 34 years of service in the same department. He belonged to the same province where he spent his entire professional life. What is your favourite memory of Manzoor Ahmad? He loved being in the field and preferred to spend most of his time outside the confines of his comfortable office. He was so dedicated and would spend his time patrolling and monitoring even when he had the choice to skip gruelling fieldwork and relax back in office. Manzoor was always cheerful despite the long working hours, which would often span over 16 hours a day. He had a demanding job and would be often working over the weekends leaving him little time to spend with us. However, whenever he would be at home he would keep everyone happy. His fascinating stories from his adventures in the field dealing with the poachers would be a source of inspiration to us. We remember him as a loving husband and father, and a wonderful friend. He was always so popular because of his affectionate personality. We’ve received many messages of condolences not just from friends and colleagues but also strangers. What did Manzoor love about being a wildlife ranger? Being part of the raid party, he was trained to patrol and apprehend illegal hunting and poaching of wildlife. We often saw him getting emotional over the killing of a tiny bird or Urial. Always jovial, the only time we would see him upset was when he would find a dead animal or when a poacher would get away. He always used to say that wildlife are creatures from heaven and he feels blessed to have been given the responsibility of protecting and saving these innocent lives from been hunted and killed. He believed that because of his job he learnt the significance of nature and felt immense pride that he could save wildlife species for our future generations. Was Manzoor the sole breadwinner in the family? How is the family now supported? Yes, like many men in our society, he was the sole breadwinner of the family as the kids are still in school. His death has left us shattered emotionally as well as financially. However, since he was a government employee; we receive a nominal pension and some other associated benefits from the government. What message do you think Manzoor would give to others about his/her work? We have lost the bread-winner and leader of our family. We are positive that Manzoor’s work was able to make a difference to the cause of protecting wildlife. We hope that his death, in the line of duty, has inspired his fellow rangers and has brought awareness amongst people about the importance of wildlife and the need for conserving them. The devotion and tireless efforts of Manzoor and his fellow rangers highlight the commitment of Pakistani wildlife rangers’ to protect endangered and iconic wildlife species and their habitats, despite limited resources and inadequate training. Manzoor is a symbol of the dedication of our unsung conservation heroes who lay their lives for protecting wildlife. They all share a common purpose of conserving the biodiversity of Pakistan, and because of their efforts, Pakistan boasts of majestic landscapes, and iconic biodiversity some of which are unique to the country. What has life been like since you lost Manzoor Ahmad? Manzoor’s death is a huge loss to not only his family, friends and colleagues but the entire conservation efforts in Pakistan. The country has suffered a huge setback in losing one of its most committed rangers. We had not realized the dangerous nature of his job until the day we got the news of his death. His colleagues also never foresaw this. With him gone, life has become very challenging for us and it will take us years to overcome his loss. We like to try and remain positive and see the bright side. Manzoor’s sacrifice has sparked concerns in Pakistan on the dangerous nature of a ranger’s job. This is probably the first time that the issue has been picked up in the media and brought to centre-stage in government forums, highlighting the need for policies and initiatives to equip field rangers with training and resources to make their work conditions less hostile. What are your hopes for other families of wildlife rangers? We learnt about the dangerous and challenging nature of his work after Manzoor was gone. I believe most wildlife rangers around the world work in extremely hostile conditions without been aware of the dangerous nature of their jobs. There is very limited knowledge of the working conditions, challenges, resource crunch, and capacity gaps of the wildlife and forest department officials in Pakistan. It is extremely critical to address their needs and influence the government to develop policies to provide them with a safe work environment, which our wildlife heroes deserve. It is reassuring that some provinces have recently introduced regulations that offer monetary compensation to the families of rangers who lost their lives during the course of duty and also offer insurance to support medical expenses of injured officials. However, these efforts are very limited when compared with the scale and scope of wildlife poaching and illegal trade in the region.